When I was a kid, we had these four children's books by playwright Eugene Ionesco. They're basically all about this young girl, Josette, who tries to make sense of these surreal tales the adults around tell her. In Story Number 4, it's her father who's distracting her while he's trying to get ready for work. As Josette goes running through the house, a couple of her dolls subtlely came to life and helped by pointing her in the direction her father was heading. The Mickey Mouse doll was immediately recognizable to me, but there was another figure that appeared repeatedly in the book I didn't recognize. It kind of looked a little like Olive Oyl, but not nearly so scrawny and she had what looked like some kind of European milkmaid outfit on. I assumed it was just some character the artist came up with. Years later, I stumbled across the same character in a poster for 2012's Les Aventures de la Ligne Claire festival. There she was, hanging out with the more familiar Tintin and Jiggs and a dozen other example of characters drawn in a ligne claire style. I figured she must be some European comic character that I'd never heard of. Then a few weeks ago, I came across her again. This time, in a poster promoting The Cartoon Museum's Der Fall Hergé & Co exhibit. Tintin and Jiggs were present again, as was a literal parade of other ligne claire characters. However, now this milkmaid was leading the parade with Jiggs! Clearly, she's a much more significant character than I suspected! It turns out her name is Bécassine. She debuted in La Semaine de Suzette in 1905, making her the first female protagonist in the history of comics by some accounts! She was created by Jacqueline Rivière and Joseph Pinchon originally as filler material for the magazine. But the character proved successful and Maurice Languereau, under the pseudonym Caumery, began to write deliberate and dedicated stories, which continued to be drawn by Pinchon. By 1950, Bécassine had appeared in 27 volumes, all but two of which were drawn by Pinchon. They are all credited as being written by Caumery, but Languereau had died in 1941 and multiple other authors continued to use the name. She also appeared three years prior to Les Pieds Nickelés, making her the original character of what is considered modern bande dessinée. It were these comics that stylistically helped to inspire Hergé years later when he would invent Tintin. The character's popularity waned, possibly due to the difficulties in keeping the character in the public eye throughout World War II. (The 26th volume of the original series wasn't actually published until 1992 because of the war.) Pinchon's death in 1953 didn't seem to help matters and, while the series was given an attempted reboot in 1959, it only lasted three volumes. Her outfit isn't that of a milkmaid, as I originally believed. It was actually based on a stereotypical peasant outfit of Breton, though it included some non-Breton elements as well. Though she was originally cast in a negative light -- La Semaine de Suzette was aimed at wealthier young girls from Paris who looked down on peasant classes -- her popularity coerced the publishers to depict her more favorably over time. The name Bécassine, though, remains. It's actually a nickname, ostensibly based on the character's home village, Clocher-les-Bécasses. However, it's also derived from the French word for the number of birds in a family of snipe, and is used as something of derogatory slang for "fool." (In America, "snipe hunting" comes from the same usage.) The character's real name was eventually given as Annaïck Labornez, but she remained more commonly known as Bécassine. 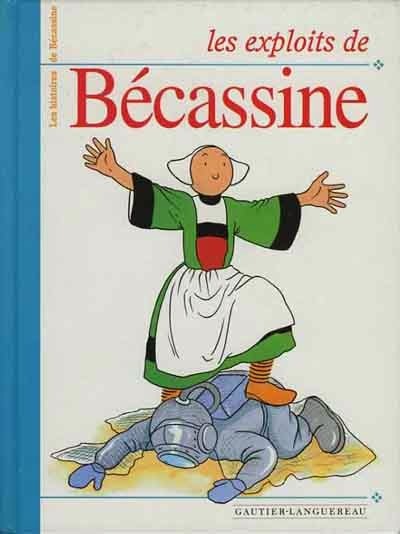 As far as I've been able to determine, Bécassine's adventures have never been printed in the United State, nor can I find any instances of her stories even being translated into English. (Though I suspect she has been.) But that would go a long ways into explaining why I remained ignorant of her for so long. Nonetheless, she is most decidedly an important figure in comics. Her adventures were adapted into movies in 1939 and 2001, and she was honored on a French postage stamp in 2005. At least the French recognize her importance even if she's largely ignored here in the States.